Twenty-seven J/24s reveled in flawless conditions as the J/24 North American Championship kicked off at Club Nautico Valle de Bravo in Mexico. Winds started at 10-12 knots and increased to 12-16, with occasional higher gusts. Current J/24 World Champion Will Welles, racing Bruschetta, of the USA has taken the early advantage with 5 points, following scores of 1,1,3. The next positions are locked in a tie at 10 points: Javier Velasquez’s Trinquete (7,2,1 on the day) and Mark Laura’s Baba Louie (2,3,5). Under cloudless skies on the picturesque lake in the mountains of Mexico, Welles opened the Championship with his first of consecutive bullets. Trailing him in race one were Laura and Kenneth Porter’s S. And in race two were Velasquez and Laura. Velasquez earned the final victory of the day, as Tony Parker’s Bangor Packet and Welles comprised the top three. Racing continues through Friday. Complete results may be found at https://yachtscoring.com/emenu.cfm?eID=5984, and photos are available on the International J/24 Class Facebook page. The 2019 J/24 Mexican National Championship took place at Club Nautico Valle be Bravo from March 30-31, in advance of the North American Championship kicking off April 2. Local Kenneth Porter was crowned Mexican National Champion, ahead of Ramon Benitez on Decolores and Javier Velasquez on Trinquette. In the overall standings, American Will Welles’ Bruschetta topped the fleet, with Porter in second and another American, Tony Parker’s Bangor Packet, in third. The Campeonato del Oeste was recently sailed on the Andean mountains lake off Potrerillos in Argentina. The dozen-boat fleet was treated to a wide variety of conditions over the three-day Championship. After 11 races, it was clear the regatta was a battle between CAMBURY, RINA and MORRUCHO. The final standings were not determined until the last race, with the team of CAMBURY (Marcelo Freytes, Ricky Homps, Torkel Borgstrom and Ezequiel Despontin) winning by just one point. Racing was so close amongst the trio of boats that second place was determined by a tie-breaker. Winning that count-back was Buenos Aires sailor Nicolas Cubria’s RINA over Sebastian Halpern’s MORRUCHO. Rounding out the top five were US in fourth and SEAWOLF in fifth. Nico Cubria commented on the sailing, “On Saturday, we sailed for the Martin Pelado Costa Cup, a tribute to past J/24 sailor Sr. Martín. The best boat of the day was MORRUCHO skippered by Sebastian Halpern. In the afternoon, there was an emotional presentation of prizes that counted on the presence of the wife and children of Martin who, together with Torkel Borgstrom, dedicated warm words and anecdotes remembering Martin. On Sunday, the wind breeze stayed strong in the 12 to 20 kts range, enabling the PRO to run four more races. Needless to say, there is great camaraderie amongst the sailors!” For more Argentine J/24 Class information, visit http://j24arg.blogspot.com/. The St. Croix Yacht Club, situated on the beach on Teague Bay in St Croix, USVI, completed its popular St. Croix International Regatta. The event takes place over three days. On Friday March 8 was Captain Nick’s Race, then on Saturday and Sunday, it was the International Regatta—two days of mix CSA handicap racing. In the CSA Spinnaker class, Peter Stanton’s J/24 CRUCIAN CONFUSION won all four races in the Captain Nick’s Race and five of the six races in the International Regatta, winning class quite convincingly. For more St Croix International Regatta information, visit https://www.stcroixyc.com/. Sunday’s race winners were Milev and Mollicone. Photos are posted on the USA J/24 Class Facebook page, and complete results are available at https://www.yachtscoring.com/emenu.cfm?eID=6055. In the waters of the Golfo di Poetto, the Windsurfing Club Cagliari hosted the first event of their winter series on the waters off Sardinia for a fleet of 10 boats. Prior to the start of the series, mistral-like conditions buffeted the island with steady 30 knots of winds, gusting to 45 knots. However, by the weekend, the Race Committee of the WCC, chaired by Betty Lai, managed to run three races on Saturday. The starts were close, tightly packed, and the first windward legs were, in particular, very shifty, making it hard for boats to remain consistent race to race. The one exception appeared to be Andrea Casale, an Italian J/24 Champion and also two-time J/24 World Champion. His team managed to round all marks in the lead and start out the series in first place. Behind Casales’ team on ARIA DELLA LNI OLBIA in the first race was Aurelio Bini’s VIGNE SURRAU in second and Giuseppe Taras’ DOLPHINS in third. In the second race, DOLPHINS took second followed by Sergio Contu’s NEW MOLLICA in third place. In the last and final race of the weekend, NEW MOLLICA took second in a close duel with Casales, with VIGNE SURRAU taking third. At the end of the racing, the J/24 crews met to talk with the Genovese champion Casales who gave advice on the boat’s handling and on the tactical choices to be competitive in conditions like those on the weekend. The overall standings (after the first five races) have ITA 443 ARIA DELLA LNI OLBIA leading with a 6-2-1-1-1 record, followed by ITA 405 VIGNE SURRAU from the Circolo Nautico Arzachena with a 3-1-2-9-3 tally in second, then Giuseppe Taras’ ITA 401 DOLPHINS sitting in third with a 2-6-3-2-5 scoreline. For more Sardinia J/24 fleet information, visit https://www.j24.it/. For complete event details, visit www.grenadasailingweek.com. Thanks to Brendan Lee for his story: After some confusion as to whether the 2019 J/24 National Championship would be held in Adelaide or not, the Cruising Yacht Club of South Australia got behind the J/24 Class and hosted the championship from the 3rd to the 6th of January 2019. Whilst down on entrants from previous years, the competition was just as fierce. A special thank you to the 10 crews who travelled from NSW and Victoria. Twelve races were scheduled over four days of racing with the first discard coming in after race 8 and the second after race 10. Day 1 and with a forecast top of 41 degrees, race management decided to put up the AP and keep the fleet in the shade until the sea breeze kicked in. Race 1 eventually got underway in about 6 knots of wind with the official sea breeze announcing itself part way up the third leg with a massive starboard lift. Those who decided to go to the left gate and out to sea prospered. Those that did not paid a hefty price, except for Team El Fideldo who charged out to sea and picked up the generous lift to record a bullet in Race 1. If anyone was watching from the shore, they would have been curious as to why there was often someone hanging over the back of the boats. This was to rid seagrass from the rudder. Unfortunately, arms were not long enough so it was just a case of putting up with it and assuming that everyone was “in the same boat” so to speak. As for the keel, well there was little that could be done other than sailing backwards, which would not only have been costly but likely pointless as it would have just been a matter of time until more accumulated. I understand Wildfire did in fact execute the backwards move mid-race. The following morning a number of brooms showed up on various boats with Vice Versa and By The Lee targeting the same Bunnings at the same time. With the first race out of the way and hopefully an early discard, the hammer went down, and By The Lee picked up Race 2. Race 3 and it was Stamped Urgent recording the win, successfully defending off By The Lee, which at times were just 4cm behind and doing everything possible to get by. A shoulda-coulda moment for sure. J/24 One Design sailing at its best! By the end of Day 1 and with 3 races sailed, it was Stamped Urgent showing the way on 7 points with Tinto and Two Dogs on 10 points and By The Lee lying fourth on 11 points. Following the day’s racing, it was the usual stories and banter about what coulda- and shoulda-been enjoyed over a BBQ put on by the South Australian Association. Thank you to Jim and Robyn for bringing it all together and Andrew and others for doing the cooking in almost 40-degree heat. 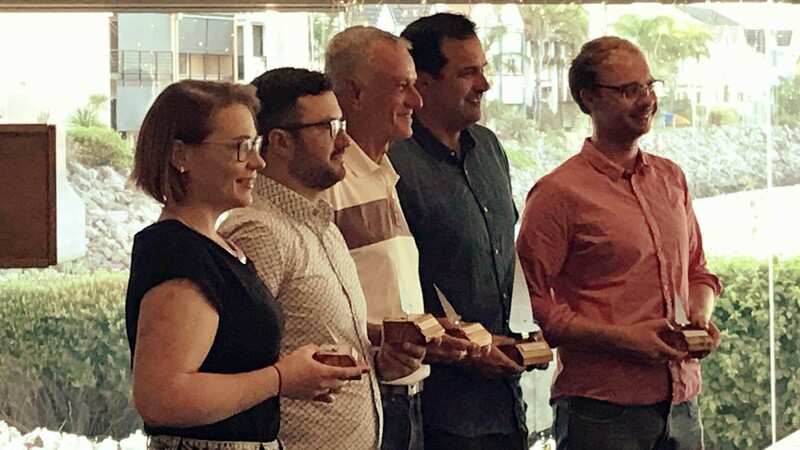 Sponsors Dog Ridge Wines joined the party by giving away 60 bottles of Rosé to be handed out to the top three places on One Design and PHS for each race and a new genoa from Peter Stevens, representing a new Chinese Manufacturer Loong Sails for the median placed PHS boat overall. Day 2 and the forecast Strong Wind Warning was spot on. St. Vincent’s Gulf was recording in excess of 25 knots. With no wind abatement in sight, race management called off the day and after just three races, the fleet was rewarded with a lay day. Some chose to go to the wineries and others decided to race go-carts to blow off the adrenaline built up from day 1. All in all, it was in fact a great J/24 community day with many teams coming together and having fun. Day 3 and the wind had moderated to 12-15 knots. Race 4 was set in at 0.6nm, however I think the race officer underestimated the speed of a J/24 and subsequently set Race 5 at 0.8nm and Race 6 & 7 at 1.0nm. With a big incoming tide, the upwind legs on the last race was seriously hard work. Race 4 and 6 were taken out by By The Lee, with Stamped Urgent picking up Race 5 and their second win. Onto race 7 and the final race of the day, and it was a new boat at the top—Wildfire—which I think started a few minutes ahead of the rest as this is how it ended up. I think Ron and the team were in the bar by the time the second boat crossed the line. Well done! So at the end of Day 3, it was By The Lee and Tinto at the top on 20 points, with Stamped Urgent just 6 points behind. With Day 2 being blown out, race management decided to get things underway an hour early on the final day, so the stage was set for a 10am start and up to four races scheduled. The Championship was far from decided. Day 4, and By The Lee knew what they needed to do….stay ahead of Tinto in every race. Race 8 got underway in about 8 knots of breeze, and it was By The Lee rounding the top mark in first place, with Tinto a few places back. However, in true Steve Wright style, the competition was picked apart, and in the end, it was By The Lee, followed by Tinto in second. With eight races sailed, the first discard came into play, and the finishing positions were starting to take shape with Stamped Urgent, Wildfire and Two Dogs all eyeing out a podium finish. Race 9, and it was By The Lee first at the top mark, however this was short lived after a massive spinnaker wrap which took a full three minutes to come free allowed Tinto and Vice Versa to sail through. With By The Lee going toe to toe with Tinto for the entire regatta, any placings between the two was huge, so in this case it was +2 to Tinto. Race 10, and By The Lee had Tinto sucking dirty air off the line, however a short tack out to sea and back over to starboard saw Tinto cross the fleet, which left By The Lee wondering what the hell just happened. Tinto recorded their second win, and once again the gap narrowed by a further 2 points with By The Lee coming home in third. With 10 races sailed and the second discard now in place, it was a showdown in the last race with just a two-point spread between first and second place. A good upwind leg on Race 11 saw By The Lee round the top mark first with Wildfire hot on their heals. Tinto was a bit further back, but again this was short-lived. Another less than ideal spinnaker launch saw Wildfire sail over By The Lee. With a close eye on Tinto, defensive mode kicked in. Wildfire extended their lead, and the fleet closed in on By The Lee with both Tinto and Stamped Urgent getting past. Provided the gap was no more than three placings and a result of fifth or better, By The Lee was okay. The next thing I saw was Tinto doing a gybe upwind, which I later understood was as a result of contact being made with Stamped Urgent. With a generous port lift, By The Lee crossed ahead of Stamped Urgent, and as a result of the penalty, Tinto was back in sixth. At the end, it was Wildfire recording their second win, By The Lee coming home in second place and securing the Championship, with Stamped Urgent crossing the line in third which also resulted in being awarded third overall by one point over Wildfire. A very consistent effort across the 11 races saw Tinto drop their sixth place, finishing second just three points behind By The Lee. And so it was onto to the prize-giving with a traditional dinner overlooking the beautiful North Haven Marina. The last few bottles of Rosé were handed out, and the winner of the genoa was awarded to Jack Fullerton on Two Dogs, who sailed an excellent regatta finishing fifth overall, just five points off the podium. After seven attempts, it was Brendan Lee, Rory Groves, Dan Cave, Peter Lee and Keren Reynolds on By The Lee picking up their first National Championship. In usual J/24 style, the night went on with plenty of laughter and cheer. The 2019 Championships was a great success. A special thank you to the CYCSA, J/24 SA organisers and volunteers and to the sponsors Dog Ridge Wines and Loong Sails for their support. The competitive J/24 Fleet of Rome had a regatta full of fun and lots of racing (eight races in total). The fleet of 22 boats was sailing in their 44th Winter Championship of Anzio-Nettuno, racing for the Lozzi Trophy. Winning the regatta was the Italian Navy crew on LA SUPERBA, skippered by Ignazio Bonanno with crew of Vincenzo Vano, Francesco Picaro, Alfredo Branciforte and Francesco Linares; they dominated the regatta with six firsts and two fourths. “On Saturday, a mistral of 22 knots and a flat sea provided the sailors fabulous conditions for racing,” explained Federico Miccio. “The crews did not seem at all intimidated by the strong wind and, indeed, had fun sailing three demanding races on the first day. On the following day, the scenario was decidedly different. The light wind between 4 and 5 knots oscillated between the Levante and the Sirocco, and then stabilized at Ostro. This allowed the Race Committee to start the racing. A large part of the fleet chose the left-hand side, while the wind was shifting to the right, and very spotty along the race course. It was a challenging day for us and the rest of the fleet.” After eight races and two discards, is was Bonanno’s LA SUPERBA crew who eclipsed the fleet. Taking second place was the young crew on J-GIUDITTA, skippered by Riccardo Aleandri, Antimo Bruno on tactics, Fulvio Marchionni on bow, and Fabio Di Bartolomeo, Vito Esposito and Fabiana Onori in the middle. Closing out the podium was Paolo Cecamore’s PELLE NERA. Rounding out the top five were Michele Potenza’s ARPION (also top woman helm) in fourth position and Massimo Mariotti’s AVOLTORE in fifth place. For more Italian J/24 Class information, visit https://www.j24.it/. The Hamburger Segel-Club in Germany hosted the Väter¬chen Frost Regatta for a fleet including 19 J/24s on the Alster Lake in front of the Hamburg city waterfront. Fabian Damm’s GER 5316 and Frank Schoenfeldt’s GER 5412 were experiencing a roller-coaster ride all the way to the final finish. Winning that battle was Damm’s crew on GER 5316 (Jannik Duehren, Moritz Boeoek, Jonas Lyssewski, Jan Eike Sihdiz) with a 1-6-1-8-1 for 9 points net. Wishing for a better outcome in their last race was Schoenfeldt’s crew on GER 5412. In the end, their tally was the most consistent on the leaderboard, with a 5-1-2-3-4 for 10 points net. Taking the bronze was Stefan Karsunke’s team of Lina Nagel, Lars Hager, Lars Gibbe and David Thompson. For more event information, visit https://hamburger-segel-club.de/vaeterchen-ohne-frost/. Bad Behavior has blocked 3132 access attempts in the last 7 days.